Download the Spain country postcard here. Download the Colombia country postcard here. Download the Switzerland country postcard here. Download the Egypt country postcard here. CESR is dedicating its efforts at the 2018 High-Level Political Forum (HLPF) to seeking a revitalized recognition that the Sustainable Development Goals (SDGs) require urgent and concrete action to remedy inequalities, with rights-based fiscal policies a key tool in that endeavor. 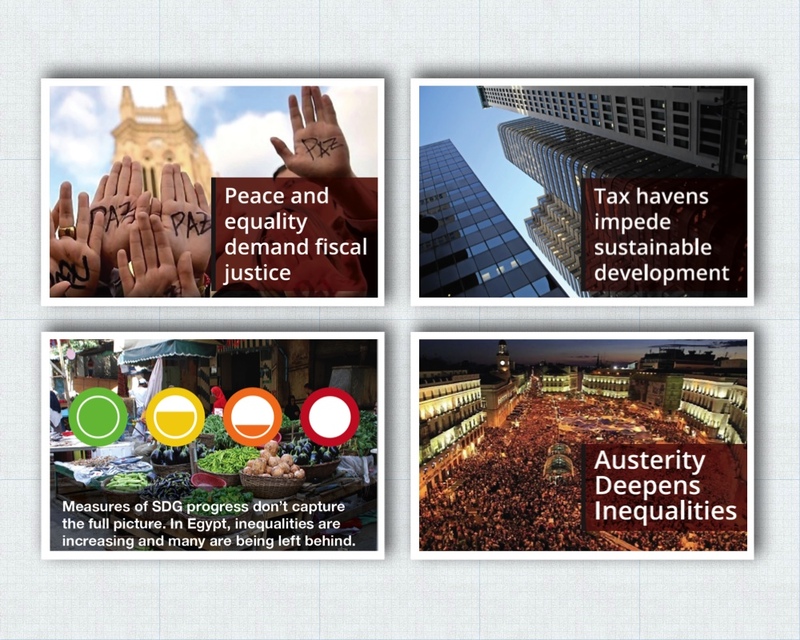 A series of postcards produced for the HLPF draw attention to systemic obstacles impeding SDG progress in four of the countries undergoing Voluntary National Reviews. 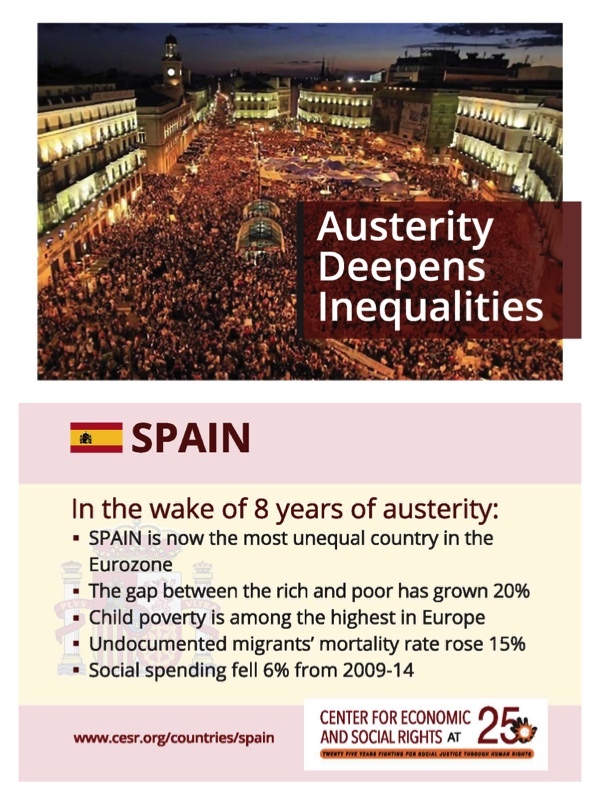 Drawing attention to the “lost decade” for human rights due to the damaging impacts of austerity, our postcard on Spain highlights the fact that "austerity deepens inequalities." As common deficiencies in SDG monitoring are papering over growing inequality and injustice in Egypt, that country's postcard showcases Egypt Social Progress Indicators (ESPI), a collaborative, more holistic tool for monitoring sustainable development progress through a human rights lens. 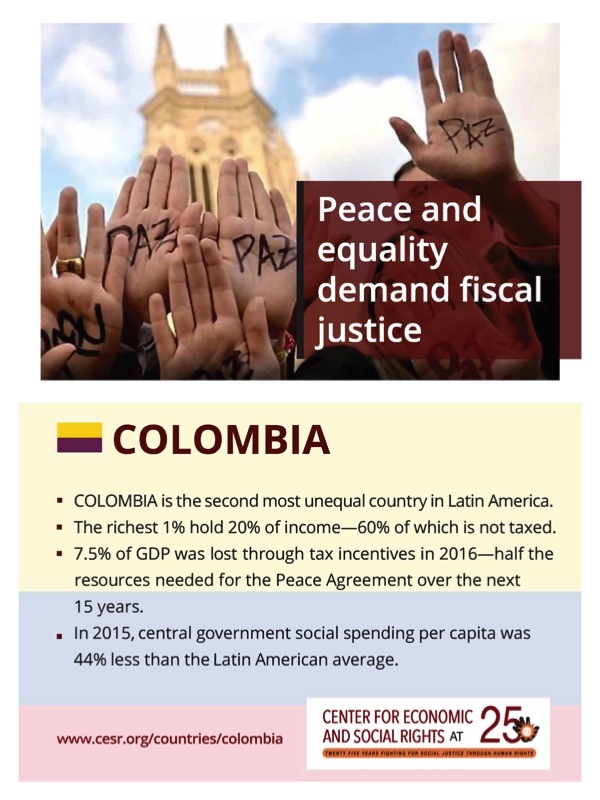 Keeping an eye on the obstacles undermining adequate and equitable resourcing for sustainable development at the national and global levels, the postcard on Colombia points out that, in this country currently implementing a Peace Agreement that is reliant on equitable tax revenues, "peace and equality demand fiscal justice." 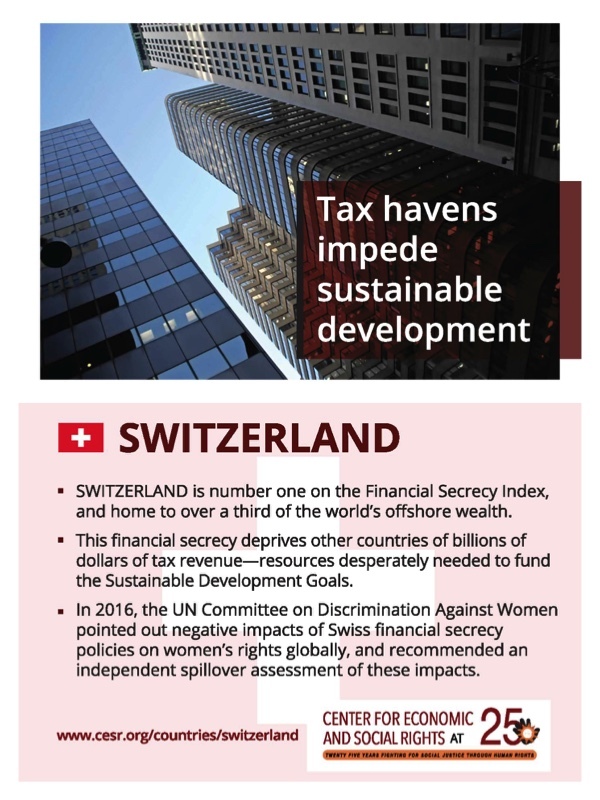 CESR will also continue to draw attention to the “spillover effects” of rich countries, such as Switzerland, where "tax havens impeded sustainable development."